(Newser) – Denmark's Prince Henrik made waves last week when he announced he was bucking tradition and would not be buried beside his wife. 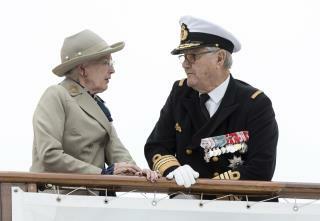 Queen Margrethe may not be so bothered by that after reading her husband's comments to the gossip magazine Se og Hør. The Local reports on a clip from the interview, which follows the prince's decision not to eventually be interred at the country's Roskilde Cathedral over complaints about unfair treatment; Henrik has the title of prince consort, but has always desired the title of king and equal treatment to his wife. In the clip, posted to the magazine's website, he emphasizes that he loves his wife, but then had this to say: "My wife does not give me the respect a normal wife must give her spouse." She is the queen - not a "normal woman". Divorce him and kick him out of the castle. What an a*hole. First world problems! And white privileged at its best! From a white middle aged woman. In the words of Steve Martin: "I believe in equality, equality for everyone.. no matter how stupid they are, or how much better I am than they are."